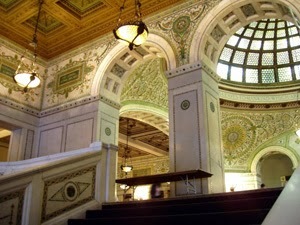 Snobby Tours®, absolutely LOVES Chicago. It's been romanticized for its colourful past and notorious 1920's and 1930's "Prohibition Era" when its South Side was frequented by gangsters and bootleggers like Al Capone, John Dillinger and "Bugs" Moran. Chicago is also known as "an architect's city". It was first determined during the 1893 World’s Columbian Exposition to be one of the world's great centers for culture, architecture and commerce. Some of the most outstanding architectural masterpieces from the late 19th/early 20th centuries built by Frank Lloyd Wright, Mies van der Rohe, Louis Sullivan, Daniel Burnham and others grace Chicago's urban landscape and surrounding area. 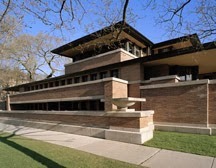 The Chicago Architecture Foundation and the Frank Lloyd Wright Preservation Trust provide many of the architectural tours around town. One of our favourites is the "Tiffany Tour", a guided walking tour of Chicago's most magnificent art glass and mosaic installations in the downtown area, including the breathtaking lapis dome in Macy's on State Street. And we can't overlook the restaurants! Chicago is definitely a "restaurant town". Chicago’s inclusive environment encouraged ethnic groups including Germans, Italians, Greeks, Irish and Polish to gravitate toward the city in the early part of the 20th century. These groups are strongly integrated into the city’s fabric today, providing countless ethnic, culinary and cultural experiences for travelers. There are several "foodie" tours, too. We particularly enjoy starting in the morning at a German bakery, continuing on to an Italian deli for sandwiches on freshly baked breads, and finishing off at a Greek market for sweets -- stopping at a "spice house" along the way, where just walking in the door and inhaling the aroma of spices and herbs is intoxicating. We had no idea there were so many varieties of cinnamon, vanilla or paprika! We love Chicago so much that we are going back in October, 2011 -- at the height of Fall Foliage in the Midwest -- and staying at one of its great historic hotels, The Palmer House. The only "downside" we've experienced in Chicago has been regarding chartered land transportation for Chicago-area sightseeing. There haven't been many choices for tour groups requiring 15-29 passenger charters -- either in availability or in pricing. We're at a loss as to why this might be because Chicago is a "convention town". However, for larger tour groups, City cabs and "The EL" are not options.